When it comes to a wireless security camera with Geofencing, there should be no flaws in your home surveillance system. Your security camera needs to record in high-quality HD, be motion activated and night-visioned with cloud storage. With this amazing camera, you get all of those features and more at a low price with no added or hidden monthly subscription fees. That’s right, it’s free for the basic plan, and it is all you need. This is our top choice for a wireless home security camera with geofencing. It’s a small elegant camera that sends instant alerts to your cell phone no matter where you are. Also known as an IP camera, it is motion and even audio activated! High resolution at 1080p with absolutely incredible night vision. You can use the app on your phone to talk through the camera remotely like an intercom giving you the ability to inform intruders that the police are coming or communicate with someone who is at home while you are not. It really has all bases covered. One of my favorite features? Geofencing, it will arm itself when you leave the area of your home. Because we all know if left to do this on our own, we would forget. You can also keep it recording motion 24 hours a day when home if this is your thing. But it is really important that this camera offers the valuable geofencing feature. If I did not have this option I would never remember to arm my system when leaving which would in return nullify the whole purpose. The best wireless security camera for your home is the Arlo Q for many reasons. I can not recommend this system enough for the home owner who wants some peace of mind about their house while away. I’ve had this security camera nearly a year, I still love it. But here’s a ghost story. I moved from my original place to a new one, and I have not only the Arlo Q, but I also have the SimpliSafe home alarm with dispatch service. Since I moved to my new place, my motion activated home alarm has gone off several times for no reason and dispatch called me while I was out. All false alarms. It is rather annoying. But I have also been hearing things fall, stuff being moved, random noises, etc. I concluded that I have a ghost even though I do not believe in such things. Well low and behold, one day while I was hanging out in my room my phone goes off, it’s the distinct sound of the app for my phone notifying me of motion detected in my living room. I look and at 6 seconds(it records the 6 seconds before movement triggers it as well), you see a white being float in a weird curve from bottom left to upper left. It does not even travel the full length of the field of view. It just pops in and out of existence. It does a bit of a curve, and it even appears to get ahead of itself at one point. It is not a bug or a light or a particle of dust. This security camera is motion activated by real stuff and has never gone off without reason until this moment in my new house where I get false alarms from my dispatch alarm all of the time. I already came to the ghost conclusion before this video captured this white force. Watch the video and tell me what you think? Feel free to leave a comment on the Youtube video. While the security system does not offer internal local SD card storage, neither do any of the major players. They all rely on cloud-based uploaded storage. Which is good, because if a thief were to take your security camera, the recorded video would already be uploaded online. Netgear Arlo is the only one that does not require you to pay a monthly subscription fee for a usable account. Note: The outdoor wifi cam version is only 720p HD video and is fully wireless so the batteries must be recharged every month to three or even four months depending on usage. The app will let you know the battery level of the camera. This is great if you need an outdoor security system. 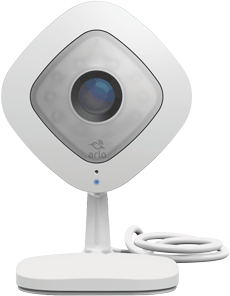 But if you only need indoor, the Arlo Q is a better option for these two reasons. Many have both, one outdoor security camera and one indoor. They both run off the same app, so it’s effortless to manage. Why it’s the best security camera for your home. It is pretty much the cutest camera of them all, that’s a good enough reason to choose this IP cam over the rest. I’m kidding, but physically the device is pretty small with a sleek white 3″x3″ front face containing the black camera lens surrounded by ten infrared LED’s in the middle. The futuristic white design inconspicuously fits in anywhere in the house. The security camera has a swivel ball mount so it can be rotated to set up the perfect viewing angle and best of all, it has a magnetic base that can be securely attached in many places with its wide angle lens. It has a cord that is nearly 10′ foot long, making it flexible and easy to plug in and mount anywhere. I have mine mounted high off the ground magnetically attached in the upper corner of the room and still have excess power cord length. But this is not even what makes it the best camera, it just happens to be aesthetically pleasing, unlike other competitors security cams. This security camera has crystal clear crisp high definition video coming in at 1080p and high-quality night vision coming in at an astonishing 720p. Netgear is not alone in these standards. Alternative maintain the same high standards, so again, why choose this one? Instant alerts to your smartphone. Free subscription and videos uploads to the secure cloud. Keep reading. Arlo Q is the best wireless home security camera for its money, and it even comes with a free cloud service subscription. Unbeatable! One of the most important features for any security system would be the quality of the recorded video output. Many systems currently on the market provide low-quality pixelated video, leaving you unable to identify the would-be perpetrator or thief. With the advanced Netgear security camera, you get instant high definition 1080p video output at 30fps uploaded directly to a secure personal cloud storage account, with no subscription cost. Night vision! Are you kidding me? Do you even know how much I wanted something like this when I was a kid? Now I have it, in my home, overseeing and protecting me. The night vision mode is high quality and astonishes me that I have this technology at my fingertips now. It uses integrated infrared technology for a crystal clear image. The camera is surrounded by ten infrared LED’s allowing it to illuminate objects up to 25′ feet away in the dark. As you can see it is very bright, high contrast and clear. This was taken in the complete dark. It switches between day and night mode automatically, so you do not have to fuss with this setting. With the phone alert system, you get instant alerts to your smartphone or email account. You can set up multiple users to receive motion and sound alerts. You can give each user access to separate cameras. When motion or audio is detected in your home, the free app on your Android or iPhone device will pop up an instant alert giving you immediate access to all unauthorized entry. You can then choose to call the police or rush home with your shotgun loaded. Not only can you enable phone notifications, but you can set up email alerts. I do have both options running. The obvious bread and butter of this whole security system revolves around the ability to detect motion within the cameras wide range of view and start recording/uploading while alerting you at the same time. 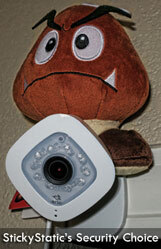 This is priceless and the main reason you would want this IP camera over any other security camera. There are still some downfalls with motion detection, especially if you have a pet at home. A common issue with motion detection is furry critters setting it off while you’re away at work. With Arlo Q, you can set activity zones on the app allowing you to bypass floor space where you would have a cat frequently walking in front of the camera. With properly calibrated activity zones, you would only pick up a human presence on the motion detectors. Unlike many other wireless cameras, the Arlo Q has a large wide-angle lens with a 130° degree field of view. This will allow one camera to cover an entire room with motion sensing technology. Because it sits on a ball swivel mount, it can be properly laid out in almost any situation to get full room coverage. Almost all home security systems require some sort of paid subscription to get the most out of your device or in some cases, even use at all. All of the major competitors will cost you a monthly fee. Netgear decided to give you full access to your cloud storage for free. The only catch? You can only store up to 7 days of video data at a time. This is fine and I can’t think of a reason why I would want more than 7 days or 1GB on the server at any given time. You can still upgrade to a paid subscription and get much more server storage in the cloud, if you need to. The bottom line here is the free 7 days of online cloud storage is a major pro when it comes to wireless security cameras on a budget. There is no other option that comes even close to this package. Netegar Arlo, basic subscription includes 7 days or 1GB cloud storage for free. Canary only 12 hours free, forced subscription of $9.99 a month. 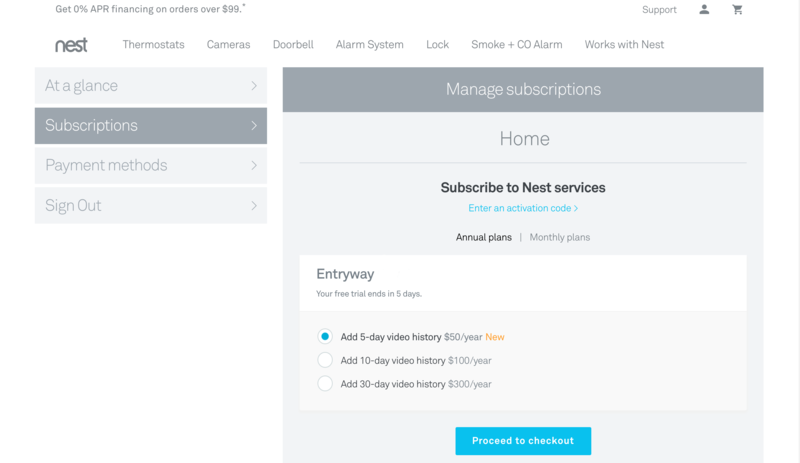 Nest, no free base plan forced $10 a month. With a free cloud subscription, Netgear’s Arlo Q is the best possible wireless security system, for your home! The constant recording is optional. I would not want to enable this myself but am thinking of doing it for a second camera on my front porch. For my inside camera, I use geofencing so that it only enables recording when I am away from home. While I prefer geofencing, I did try 24/7 recording, and it barely used any data on my internet plan. I did expect more so this was good. Geofencing is one of my favorite features for this camera. It uses your smartphone to determine your actual location. With this, the camera will automatically arm itself when you leave home or disarm when you come home. It sets up a geographical fence if you will and does not record you when you are within its boundaries. Because I do not want it recording my every motion while at home, I have it set to auto arm when I leave home so that it only uploads video from motion detection while I’m away. Once a clip is uploaded to your free cloud account, you can easily view it by selecting a date and video recorded on that date. You have the option to share a video via email, direct link, Facebook or Youtube. You can use the Arlo Q for much more than just security. It can be a lot of fun among friends on social media. With the phone app, you can not only hear the audio in the room of the camera; you can use the app to speak through the camera like a two-way intercom! You can, in theory, tell a would-be burglar they have been recorded, and the police are on the way, or you can talk to a loved one at home. Or mess with people and start speaking from above. The microphone is high quality, and this is a great tool. The delay is 1 to 3 seconds for me, but I imagine that could change with your internet plan. The camera connects to your router via the wireless signal. It can connect to the 2.4Ghz or a 5Ghz band router. This is great because you can set up cameras all over your home without a wired connection. It is straightforward to set up via the app and once connected, you pretty much never have to deal with it again. I have had mine running for months with no intervention. Now and then I get the blinking purple LED indicator which means that the “wireless signal is low,” but it maintains a solid connection with no issues. I wish this status light would go away because the camera is working fine all the way in the back of the apartment far from the router. While the internet is wireless, the camera does still need to be plugged into an electrical outlet for power. I do prefer this, so I do not have to worry about recharging batteries. But maybe you want to install your Alro camera somewhere you do not have access to an electrical socket. The provided cord is USB to power adapter meaning you can plug the USB into a battery bank for power. I have tested this with a small battery bank that I have, and it did power the unit all day. In the case that you wanted to continue to run the camera on a battery pack, you would need a larger bank and to recharge it as needed. Another bonus is that the battery bank can be plugged into an outlet, and then the camera plugged into the bank. This means if the power goes out, the Arlo stays on as if it were running from a backup generator. The installation is almost non-existent. Your grandparents could do it. You open the phone app, answer a few easy questions, select your existing wireless network and a large QR code pops up prompting you to hold your phone screen in front of the camera so the Arlo Q can scan the code and set itself up. It then syncs with the camera, and you’re done. It comes with a mounting plate, screws and my favorite part, a magnetic mount. You do not have to do anything other than snap it in place. The magnet is really powerful to ensure the mounted camera does not move. Ease of use is another crucial deciding factor. If you’re on the market for a home surveillance system, chances are you are not a network admin, and you want something that works. The Netgear Arlo Q comes with an easy to use application for both the iPhone iOS and any Android phone. The user interface has large clear navigation and easy to understand features and icons. Not only that, it has a website interface and an app for the Apple TV. It is straightforward, intuitive and quick. This makes it a great choice for a free home security system. You can log in via a password or thumbprint if your smartphone is thumbprint enabled. Mine is set for thumbprint with the one-touch log on for live monitoring. You can network your cameras and have up to 5 running on your free cloud storage account! If you pay the subscription fee of $99 for a full year($8.25 a month), then you can have up to 10 cameras attached to your account. For $149 a year($12.42 a month), you can have up to 15 cameras on your account! Why on earth anyone would need 15 cameras is beyond me, but dang that is a big house. I have the free subscription and won’t ever need to upgrade so I do love this. The other two main competitors, Nest and Canary, require some monthly plan to be of any use out of the box. This is poor business practice and should be avoided. It will cost you a lot more in the long run. You have modes such as always armed and geofencing, but you can also schedule times for your Arlo Q to be armed. Some people like to set it for when they are sleeping or when they leave for work. If you know you leave for work every morning at 8 am, this is very easy to set up. Stock image provided by Netgear. As mentioned, this is not the “ultimate security system”. It is the best wireless home security camera. Someone could still cut your power or internet and then enter. The ultimate way to secure your home while away would be an actual security system with 24 hour active dispatch monitoring. I have this on top of the Arlo Q’s. Stay tuned for an entire article on SimpliSafe and why you need this full system to be foolproof. Quick details, it is paid, $15 a month for 24-hour dispatch service. You must get the package with a camera because if they cannot verify a burglar in your house via live stream, they can not dispatch the police. The system uses battery backup and cell service to send the signal to the dispatch center so the thieves can not cut your power. Again, subscribe for future articles on this. For now, you really should get the Arlo Q because most thieves are too dumb to cut your power or know that you have a security camera in your home. As always, ask any questions below.